According to the U.S. Department of Transportation, “The average crash rate for horizontal curves is about three times that of other highway segments.”1 About seventy-five percent of such crashes are speed related and involve “a single vehicle leaving the roadway and striking…fixed objects or overturning.”1 As a result of such startling statistics, there is a plethora of possible solutions that have been tried and tested with the aim of reducing the dangers of horizontal curves. One road treatment that has successfully reduced run-off-road (ROR) crashes on horizontal curves is the use of rumble strips on the road shoulder. Their presence has, according to one study, reduced ROR incidents by 20 to 30 percent on rural freeways.3 While this sounds promising, it should be noted that the study included both straight and curved road segments. Little is known about how effective shoulder rumble strips are on horizontal curves. Potential disadvantages to the use of rumble strips include their incompatibility with bicycle traffic and their negative impact on pavement life. At a scientific level, ROR events on horizontal curves occur when the friction achieved from the tires’ contact with the road surface is less than that required to overcome the centrifugal force trying to force the car to travel in a tangent rather than in an arc matching the roadway. It stands to reason, then, that increasing the friction decreases the likelihood of road departure. HFST was also applied to a curved interstate bridge in Cedar Rapids, Iowa, where one year after application it had reduced crashes from an average of more than ten per year to just 4 in the 12 months after application4. Such dramatic crash reductions make it clear that HFST has great promise in traffic safety. A particular challenge associated with the use of dynamic message signs is making sure the messages are only displayed to cars exceeding the advisory speed. If drivers experience multiple false alerts, they will ignore the messages in the future. Further, different types of vehicles can safely negotiate a curve at different speeds. A compact car, for example, can travel through a horizontal curve at a greater velocity than a van. A semi-trailer must slow to a lower speed than a pickup truck. Thus, the speed sensor must be able to determine not only vehicle speed but also the type of vehicle approaching given the geometry of the curve. Fortunately, new triple-beam technology has been developed that can make such determinations. This technology is far superior to single-beam versions. The triple-beam detection system uses Doppler radar and can recognize eight different vehicle types with 99.5% accuracy (below). 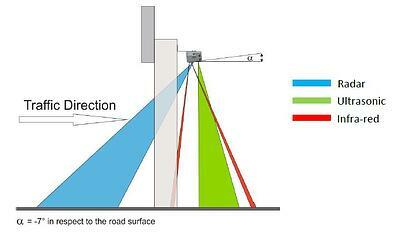 Many sensors calculate only the height of the approaching vehicle. Another way to combat the relative ineffectiveness of static signs is to make them dynamic instead. 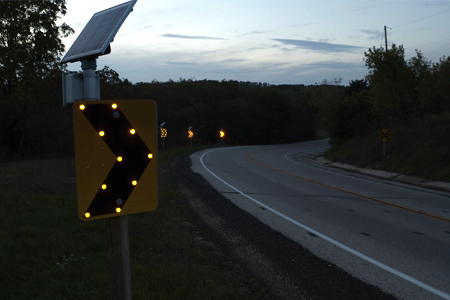 In many states, chevron signs have been enhanced with solar-powered LED lights that flash when a vehicle is detected exceeding the recommended speed for the horizontal curve (below). In one study in Wisconsin, TAPCO’s BlinkerChevron™ Dynamic Curve Warning System proved 97% effective in reducing crashes. An advance curve warning sign, which may also be enhanced with LEDs, is equipped with a radar speed detector with a range of 300 feet. When an approaching vehicle exceeds the advisory speed for the approaching horizontal curve, the detector wirelessly communicates with the chevron signs arrayed along the perimeter of the curve, triggering them to flash simultaneously or in sequence, depending on how they have been programmed. Dynamic curve warning systems have proven effective on urban interstates and rural two-lane roads alike, but they are especially suited to rural roads. They are solar-powered, so no local power is necessary. 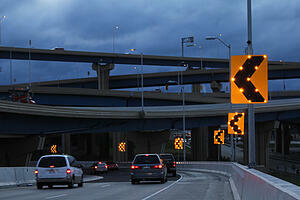 And lighting on such roads can also be lacking, making the flashing LEDs more noticeable (below). A study of 12 rural, two-lane horizontal curves in five states was conducted by the Center of Transportation Research and Education in 2015.1 The particular stretches of road were chosen based on a number of factors, including speed limit, the existence of static chevron signs, crash statistics, advisory curve speed, and average daily traffic. Simultaneous flashing 3 times per second with a speed threshold of 5 miles per hour above the advisory speed. Given the high crash rate at horizontal curves, and the high fatality rate associated with such crashes, increasing safety at those locations should be a priority for every organization tasked with keeping roads safe. Since we can’t eliminate curves, nor are there unlimited funds for costly redesigns, many other options have been employed to enhance horizontal curve safety. More recently, advanced technology has shown great potential in slowing drivers down so they can safely negotiate curved sections of the road. Smadi, O., N. Hawkins, S. Knickerbocker, S. Hallmark, A. Pike. Evaluation of the Sequential Dynamic Curve Warning System – Final Report. Center of Transportation Research and Education, Ames, Iowa, 2015. Department of Transportation, Federal Highway Administration. Low-Cost Treatments for Horizontal Curve Safety 2016. 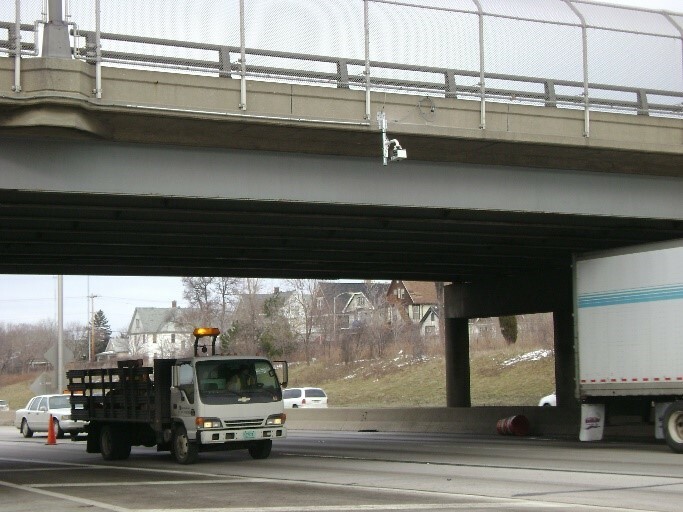 Accessed at https://safety.fhwa.dot.gov/roadway_dept/countermeasures/horicurves/fhwasa15084/ch4.cfm#ch4 on March 21, 2019. National Academies of Sciences, Engineering, and Medicine 2004. A Guide for Reducing Collisions on Horizontal Curves. The National Academies Press, Washington, DC, 2004. Accessed at https://doi.org/10.17226/13545 on March 15, 2019. Wisconsin Transportation Information Center. “High Friction Surface Improves Safety on Curves,” Spring 2014. Accessed at http://epdfiles.engr.wisc.edu/pdf_web_files/tic/crossroads/xrds_2014_1.pdf on March 25, 2019. 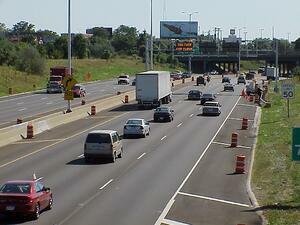 AASHTO Journal, American Association of State Highway and Transportation Officials. “Nason Calls For More Rural Road Safety At FHWA Nomination Hearing,” 2019. Accessed at https://aashtojournal.org/2019/02/01/nason-calls-for-more-rural-road-safety-at-fhwa-nomination-hearing/ on March 18, 2019. Department of Transportation, Federal Highway Administration. Techbrief: Indoor Simulator Study and Field Study Evaluation of Sequential Flashing Chevron Signs on Two-lane Rural Highways, 2018. Accessed at https://safety.fhwa.dot.gov/roadway_dept/countermeasures/horicurves/docs/fhwasa18074.pdf on March 15, 2019.